Gauhati University Exam Routine 2019 has been released for the semester exam online on the official website, www.gauhati.ac.in. Candidates appearing for the university semester exam can check the Gauhati University Exam Time Table from this page. The examination date, time, day, subject code and the paper name is provided on GU Exam Routine. Gauhati University conducts the semester exam in two session morning and evening. The morning session starts at 09 Am and the evening begins from 01 PM. The exam time is not the same for every course, so check the exam commencement carefully. Students can even check Gauhati University Exam Routine from the Applied college. Only the eligible candidate are allowed to write the semester exam and also the candidate has to submit the exam form and fees to write the exam. For more information on Gauhati University Exam Routine 2019 pdf. Latest: Gauhati University has released the notice regarding the online mode of Form fill up for M.A., M.Sc., M.Com., MBA(BE), MBA, Integrated Commerce, MLI.Sc. and Mass Comm 2nd and 4th semester with Repeat (new course) Examination 2019. Semester examination form filling process has started. Candidate can fill the form through the link mentioned below. Appearing candidates are advised to appear to the exam centre 30 minutes earlier. Also carrying the Admit Card to the exam hall is very important. Check the table for Gauhati University Time Table. Exam Routine: Check Gauhati University Exam Routine from the table and form the official website, www.gauhati.ac.in. Click Here to fill the Examination Form. How to Download Gauhati University Exam Routine 2019? Click the link provided in the table to check to download the exam routine. Students can follow the steps to check Gauhati University Time Table. Students appearing for Gauhati University semester and annual exam should carry their admit card issued by the university. Any students without Gauhati University Admit Card will not be entertained in the exam hall. Make sure to download the Admit Card before the examination. Students can even collect the admit card from the college they are studying. Admit Card is the most important to carry on the day of all semester examination. Carry an identity card along with the Gauhati Universit Admit Card to the exam hall. The Admit Card is permission to attend the semester examination. Students must verify the printed details on the Admit Card after downloading it. 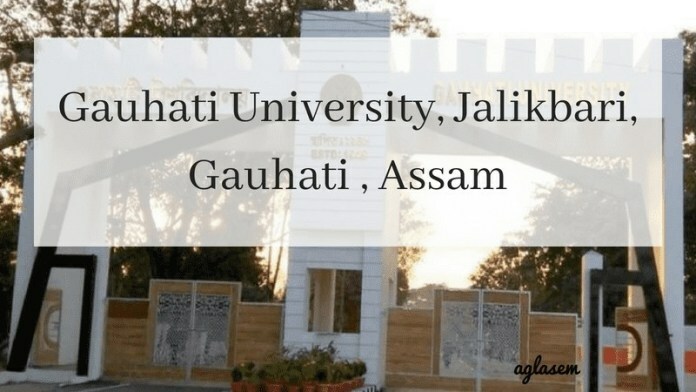 Read the article on Gauhati University Admit Card 2019 for more detailed information.